Often times in K-12 settings, when faced with a situation that crosses a boundary, interpreters will use ASL signs like BACK-OUT (of a situation), DRAW-THE-LINE (between me and the consumer), THINK-SELF ("It's up to you.") and NOT-MY-BUSINESS. 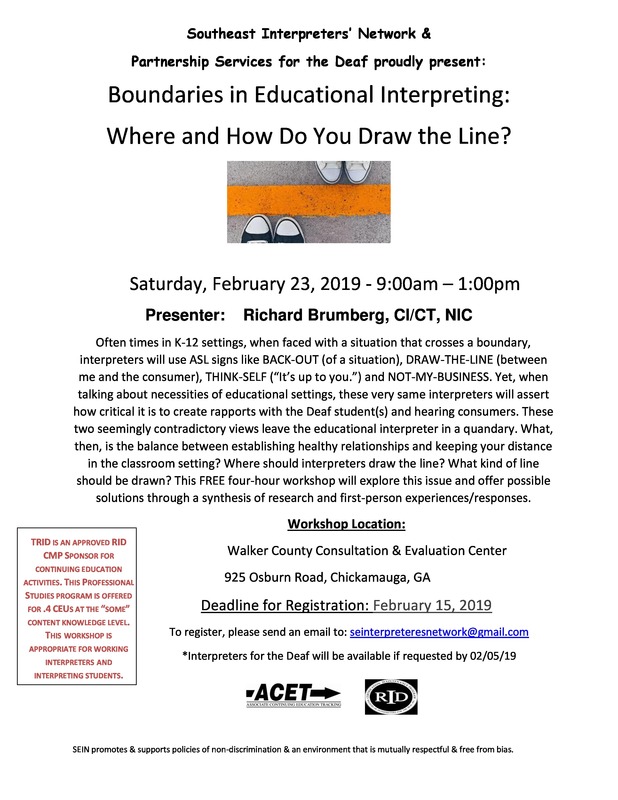 Yet, when talking about necessities of educational settings, these very same interpreters will assert how critical it is to create rapports with Deaf student(s) and hearing consumers. These two seemingly contradictory views leave the educational interpreter in a quandary. What then, is the balance between establishing healthy relationships and keeping your distance in the classroom setting? Where should interpreters draw the line? What kind of line should be drawn? This FREE four-hour workshop will explore this issue and offer possible solutions through a synthesis of research and first-person experiences/responses. .4 RID CEUs at the "Some" Content Knowledge Level. This workshop is appropriate for working interpreters and interpreting students.